About 2000 BC a knowledge of metal working had arrived in Ireland and the Bronze Age began. The tombs of the previous era were generally large complex structures which contained multiple burials, either as inhumations or cremations. During the Bronze Age burial tended to be in smaller box-like structures called cists. Single burial, either inhumation or cremation is the usual rule although multiple burials have been found. Many of the burial cists have been found beneath small round cairns and larger cairns often have multiple cists. Although metal objects were in common use throughout the era stone tools continued to be used, probably because they were cheap and easy to make. During the Bronze Age many of the standing stones and stone circles in Ireland were erected. 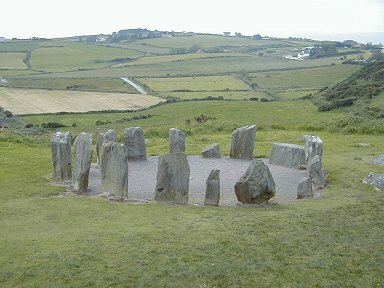 Burial cists have been found associated with some standing stones and circles but the purpose of many of these monuments remains unclear. Some of them had an obvious astronomical use and some may be associated with an unknown ritual. Many of the standing stones may have been simple boundary markers. During this era many large boulders and rocky outcrops were decorated with cup-and-ring marks. In some cases these were natural solution pits which were surrounded by a circle, or multiple circles. In many cases the cup-marks are artificial depressions and in some cases they are carved without the surrounding circle. In other sites spirals, similar to Neolithic art, have been found.